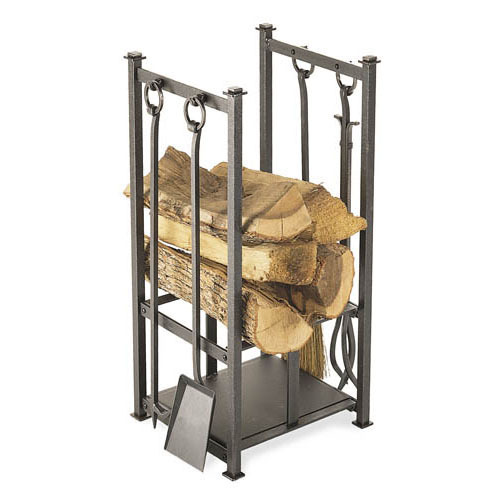 This hearth center comes with a fireplace tool set and provides a convenient place to store your logs as well as kindling or fire starters. The tool set includes a shovel, poker, broom and tongs, all of which hang on the outside of the rack. The logs occupy the upper section while smaller splits, fatwood, pine cones, or newspaper can be stored in the lower section. The rack is made of steel and has a vintage iron finish. Its approximate dimensions are 14.5" W x 30" H x 13" D. This item carries a limited lifetime warranty. Are the hooks steel or plastic? These hooks are made of steel (angle iron). The product matches the online picture very well. But I was a bit disappointed that the quality of the product is lacking, especially after what I paid. The overall product looks kind of cheap. Also, I felt like I had to force a lot of the pieces to fit them together properly.